"Soke" Dr. Benson Campbell featured to the right and Professor Jeff Speakman action movie star in the "Perfect Weapon" and many more featured to the left (Masters Hall of Fame 2009) Long Beach Cali. Both were inducted. 1990 - Continued studying "Ju-Bushi-Do Martial Arts" under the Great Grand Master Ben Pryor - Present rank 7th Dan/Degree. 1991- Began studying "Niku-Bushi-Ryu Kempo Karate" under Grand Master Don Le'Fields - Present rank 7th Dan/Degree. 1993 - Began studying "Japanese/Nippon Kempo Karate" under Grand Master Lee Cleveland. 1993 - Began studying "Philippine Art of Knife and Stick Fighting" Certified under Grand Master John Saucier. 1997 - Began studying "American Kempo Karate" under Grand Master Bear Streat - Present Rank Black Belt. 1997 - Became certified teacher of Ju-Bushi-Do Kempo Karate. 1997 - Founded "Kokoro-Bushi-Do Kempo Karate" present rank "Soke"
1999 - Accepted as a member of the "Street Fighters Guild". 2000 - Rank recognition through the "United States Karate Alliance". 2003 - Inducted into the "Universal Martial Arts Hall Of Fame" (Supreme Sokeship Council) Houston, Texas. 2004 - Appointed as (Martial Arts Instructor) for "Gwinnett Count Parks & Recreation". 2005 - Received International Recognition as (Founder & Stylehead) of Kokoro-Bushi-Do Kempo Karate through the "United States Karate Alliance". 2005 - Received International Recognition as (Founder & Head of Style) of Kokoro-Bushi-Do Kempo Karate though "Karate for Christ International". 2006 - Received (Instructor of The Year) award for "Gwinnett County". 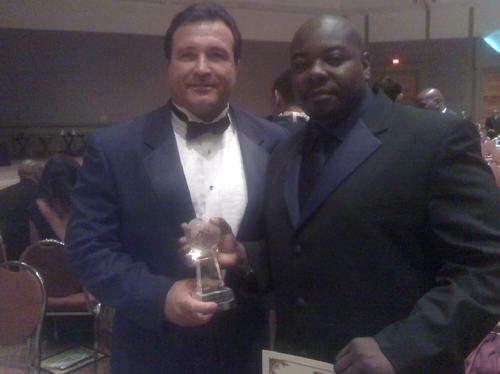 2007 - Induction into the "USA Martial Arts Hall of Fame" (Alliance) Orlando, Florida. 2007 - Appointed as (Martial Arts Instructor) for the "Boys & Girls Club" Metro Atlanta. 2007 - Appointed as "Alliance" (Unity of All Martial Arts) (Georgia State Director for 2008) * The Governing Body for "USA Martial Arts Hall of Fame", "USA Martial Arts Team", "University of Asian Martial Arts Studies" etc. 2008 - Received (Doctorates of Martial Arts Philosophy & Martial Arts Science, Ph.D./Ma.D.Sc) through the "University of Asian Martial Arts Studies" Waikiki Beach, Honolulu, Hawaii. 2008 - Second Induction into the "USA Martial Arts Hall of Fame" as a 2007 Alumni receiving Doctorates of Martial Arts Philosophy & Martial Arts Science, Ph.D./Ma.D.Sc through the "University of Asian Martial Arts Studies" Waikiki Beach, Honolulu, Hawaii. 2009 - Appointed as (Director of Martial Program Ages 10-25), with "The Melanie Thornton Youth Arts Foundation". 2009 - Re-inducted into the "USA Martial Arts Hall of Fame" as (Head Founder Of The Year & Doctorate Holder) through "University of Asian Martial Arts Studies" Cocoa Beach, Florida . 2009 - Inducted into the "Masters Hall of Fame" as (Founder - Head Master) receiving the (Silver Life Achievement Award) Long Beach,California. 2009 - Accepted as member of GMAU "Gospel Martial Arts Union International". 2011 – Accepted the offer to be on the (Board of Directors) for "Lovoi-Sustainable Villages" a 501c3 Non-Profit Organization whose mission is to support and restore the Congo in Africa. 2012 - Honored as "Humanitarian of The Year" at the "1st Annual Keystone Leadership Awards" held in Atlanta, Georgia. 2013 - Completed process and approved by Dekalb County Board of Education as a Martial Instructor for the School System. 2015 - Added to the creditable and bonifide on-line web forum of Facts for Kempo/Kenpo history Grandmasters list of legit Kempo/Kenpo Grandmasters for being the Soke (headmaster) and Founder of Kokoro-Bushi-Do (KBD) Kempo Karate since 1997 see www.Urbin.net see Kenpo/Kenpo Faq. 2017 - Responsible for Championing KBD KEMPO KARATE(Holistic) Community Service Leadership Program to Be the First Like It Approved by the Courts as A Means and Option to Complete their Court Order Probation. 2018 - Responsible for Championing the Kokoro-Bushi-Do Kempo Karate Community Organization aka KBD KEMPO KARATE(Holistic) to being recognized by Gwinnett County's BestofGwinnett.com in the Metro/Greater Atlanta area.. As a Honoree chosen in one of the 20 different industry categories from which only one buisness/organization of each industry category is selected a year in a county of 900,000 people and thousands of businesses.. Note: Childhood years of training in the Martial Arts not included in this bio in respect to the true understanding and meaning of the Martial Arts. "Soke" Dr. Benson Campbell has been engaged in the martial arts over 30 years and he hasn't missed a week of studying and training in over 29 years.